Are you looking for a way to increase storage in your home office that is both functional and professional? Maybe you’re looking to show off your collection of books in the living room with stylish shelving? Maybe you finally want to turn that outdated basement rec room into the party space you’ve always wanted? Cabinet Discounters can build anything you need! We are more than just amazing and functional kitchens and bathrooms. Our skilled designers can create and build a custom cabinet configuration for any room in your home, outdoor space, or office. Maybe you want to create an in home library with wall to wall built in bookshelves? Or maybe you want a one of a kind outdoor kitchen entertainment space? Maryland’s Cabinet Discounters has thousands of different cabinet styles, colors and configurations available that will compliment your design without breaking your budget goals. Cabinet Discounters has extensive experience in many unique and custom built ins throughout the Maryland, Washington DC and Virginia area. Cabinet Discounters’ customer service oriented designers will happily work with you, or directly with your contractor, assisting you in every step on the way to creating the space of your dreams. Our designers are creative and inspired and have an extensive knowledge base of Cabinet Discounters inventory. They are also very familiar with the inventory of our partners in countertops, plumbing fixtures, hardware and other accessories as well. 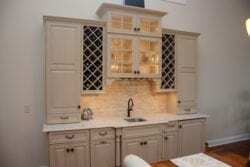 Cabinet Discounters offer expertise in design and ordering. We insure accuracy through frequent on-site visits to your project. Cabinet Discounters’ design team will help you decide on and arrange all the little details of your project to make sure the installation goes smoothly, and that you, our customers, are satisfied with the results. With over 30 years of experience in creating beautiful and functional spaces, you can trust Cabinet Discounters for all of your cabinet design needs in the Maryland, Virginia and Washington DC area. You too can create a beautiful, functional and comfortable space where your friends and family will want to gather. You can get started today by visiting one of our seven convenient showrooms and request a consultation online!